Writers seek out writers. It’s what we do. We join writing groups, not just to give us someone to hang out with on a Saturday afternoon, but because other writers get the angst of writing, the frustration when the words won’t come, the disappointment with each rejection. Perhaps most importantly, these communities give like-minded mystery writers a chance to discuss the various ways to kill people . . . in the literary sense! One national community that supports our passion is Sisters in Crime (sistersincrime.org) and offers chapters that meet locally. 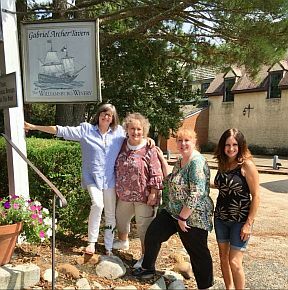 Mystery by the Sea serves southeastern Virginia, and Central Virginia chapter serves the Richmond area. The two chapters collaborated on three short-mystery collections; Virginia is for Mysteries, Virginia is for Mysteries Volume 2, and 50 Shades of Cabernet. We hit the road, literally, driving all over the state to promote the books. After the first book, planning and strategizing meetings were needed for continued marketing efforts and compiling future books. It made sense to meet halfway between the chapter locations. That meant Williamsburg, Virginia. Lucky for us. Even luckier, Williamsburg has its own winery, nestled in a bucolic vineyard setting which has a nice restaurant. It turns out good food and good wine lead to good writing projects. Teresa Inge threw the challenge down in 2016. It was a long and winding writing road, but finally, we are happy to announce the birth of the collaborative efforts of Teresa Inge, Heather Weidner, Jayne Ormerod and Rosemary Shomaker: To Fetch a Thief, Four Fun “Tails” of Theft and Murder. We hope you enjoy reading them as much as we enjoyed writing (and meeting about) them!